Azure waters surround Leros Island, Greece. No better place to soak up the Mediterranean sun than on the many rocky outcrops across Leros Island. A reminder of the Orthodox religion's influence in the Greek Islands. The fish don't get much fresher than on Leros Island, Greece. If your concept of a Greek island holiday is doing a circuit of the top five most visited islands along with 12 million other travellers each summer, think again. Leave the maddening throngs of tourists to their own devices and make your way to the tranquility and unspoiled beauty of a little known island named Leros. Idyllic Leros is a tiny member of the Dodecanese island group, closer in proximity to Turkey than to the Greek mainland. It is this strategic location that has made it hot property for centuries – taking turns in the hands of the Byzantine empire, Ottomans, Italians, and the British. Looking out from the medieval castle of Leros at the very peak of Apitiki Hill, it’s easy to see why this island was at the centre of so much attention. At this vantage point, Leros below looks like a mythical storybook creation; its rugged hills dotted with lolly-hued neoclassical buildings clinging on for dear life. The islet has curves to rival Kim Kardashian with its undulating coastline – a cartographer’s worst nightmare – giving way to an endless selection of private coves. The Aegean seems impossibly blue and the bobbing white sailboats are the only giveaway that this is not a painting. Leros’ gently curving roads can only appropriately be seen by Vespa, so I take off to explore what else the island has to offer. It’s easy to navigate the cobblestone streets of the main town of Agia Marina because – with only 8000 residents and so few tourists – there is no road congestion. It’s a joy to explore the laneways lined with lovingly restored pastel buildings with iron fretwork. Stop at the small waterfront cafés and seafood taverns or duck into the backstreets to discover the charming bakery, art gallery and bookstore. The Italians left the greatest mark of all the invaders; a legacy of Italian rationalist architecture, especially in Lakki. The town is a time capsule of their former glory – government buildings, a cinema, and even Mussolini’s summer mansion are being returned to their heyday. Amplifying the feeling of being frozen in time is the town’s clock tower, eerily stuck at the exact time that Germany dropped the first bomb on Leros during WWII. What strikes me most about Leros is that the mosaic stone paths, elegant buildings, crystal clear bays, omnipresent castle – they are all yours. It is a secret haven for discerning holiday makers, many of whom ‘discovered’ the island years ago. They have since picked up derelict neoclassical properties and restored them as their fabulous summer homes. Leros is on par with Positano, well before John Steinbeck made it famous with his writing. Life in Leros is uncomplicated. With its intimate population, everyone went to school together, are neighbours, or are related. This means they are very aware of who is a visitor to the island, and if you engage them in conversation, they’re all ears. Rules are very lax, time is not adhered to, and it’s a place where anything can happen. Case in point: It’s been a day of beach-hopping from private little unmarked coves to sign-posted beaches like Vromolithos and Blefouti, which have all the amenities, plus cafés and bars to boot. I find myself at Koulouki Beach with its synonymous tavern. The done thing is to have mezze (small tapas-style dishes), dive in for a swim and come back for more sustenance. In the stunning aqua cove, we meet a baby octopus in the shallows, which we ceremoniously christen Aleko. When Aleko rudely inks my arm, the chef quickly transfers him to the grill and, before we know it, we are toasting to Aleko’s short but eventful life with ouzo. Though you’re never far from a traditional tavern, there are a few gems that sparkle in their brilliance. At Psaropoula Tavern, in the picturesque fishing village of Panteli, dine on the day’s fresh seafood catch from your table nestled in the sand and overlook an intermingling of fishing boats and yachts. Milo’s Tavern in Agia Marina is the perfect example of chefs putting a modern twist on classic Greek dishes like the incredible paper-thin octopus carpaccio, or baked cheese wrapped in crisp kataifi (shredded filo pastry) drizzled with caramelised balsamic. The outdoor space is incredibly atmospheric, with an illuminated traditional windmill at its side, tables strategically placed with a view of the port and the castle above. The chic fit-out at cliffside bar Café Del Mar make it the ideal place to sip on a cocktail with views of Vromolithos Beach below. White leather couches, dim lighting, and effective use of candles make for a cool island vibe, while the hottest European summer tracks liven things up. The sun is setting on our last day in Leros and we find ourselves at Alinta Beach, directly opposite our quaint villa, taking in the last rays of sunshine. Locals have started their evening promenade, and familiar faces stop to banter with us about the day’s happenings. The full moon rises out of the still sea like an enormous crimson disc and we gasp at the stunning sight. The group spontaneously decides to have dinner on the beach. This sets off a chain of events: a set of tables are relocated from our villa’s courtyard to the waterfront, pizzas are delivered to us on a motorbike, a bottle of ouzo is conjured up by our neighbours. Over the course of the night, passers-by stop to join us, and someone has a flash of brilliance deciding to go for a midnight swim. I take a quiet pause to reflect on the night. On the bay, the lights twinkle in Agia Marina and the medieval castle appears to watch over us. Yes – rules are very lax, time is not adhered to, and it’s a place where anything can happen. Etihad Airways fly daily from Melbourne and Sydney to Athens via Abu Dhabi. Fares start from $1905, but vary widely during peak season from June to August (etihadairways.com). 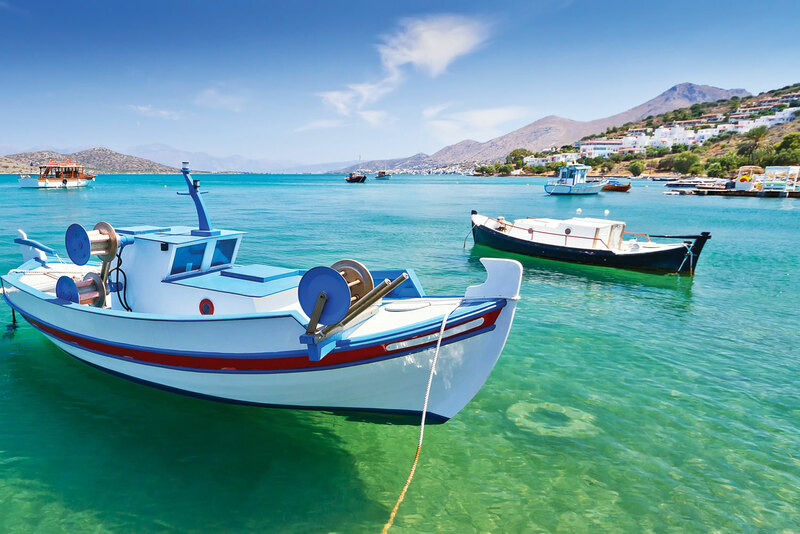 From Athens, it’s a short one-hour plane ride to Leros with Olympic Air (olympicair.com) from $121. Leros isn’t inundated by crowds during July and August, but it is sweltering during this time. June and September are far more pleasant. 1. A visit to the fascinating war museum, housed in an actual military tunnel built during the Italian occupation during World War II. Most of the relics have been donated by local families whose island went from serene paradise to bombed military naval base during the war. 2. Taking in the dramatic view at sunset from the 11th-century castle at the peak of Apitiki Hill. Its church is a destination for thousands of pilgrims, who climb the 400 dramatic steps from Agia Marina on the feast day of 15 August. It’s a moving sight to witness. 3. Walking the narrow causeway to tiny Agios Isidoros Church, which stands alone on a miniscule island. A mysterious soul keeps the church in good condition, but you’ll likely have it to yourself for your own quiet moment of reflection. The majestic views and inviting atmosphere are undiscovered by big tour operators. You’ll feel like Leros is your own private retreat. Because of its obscurity, the island does not cater to the novice travellers, so you are left to find your own way to explore the island. 1. Most establishments don’t have internet booking facilities, so it’s best to call to make reservations. You shouldn’t have any trouble finding accommodation, except around 15 August, one of the most important religious holidays in Greece. 2. Public transport is non-existent, bar a rare bus service. Be prepared to hire a car or motorbike, or rely on taxis. 3. As with most Mediterranean countries, siesta happens loosely between 3pm and 6pm, and you’ll find most shops closed during this time. You’ll get used to it. The second image is not Leros it’s monastery on Patmos! Thanks for your feedback Sigrid – great pick up! We have amended our images accordingly. in summer you will be able to visit turkey from leros!! Yes! You are so right!!! it is! There is no better place in the whole world than Leros.